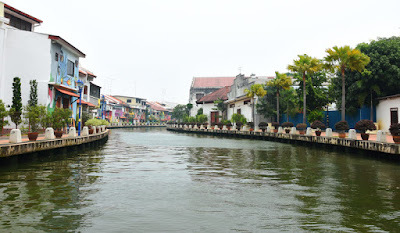 Melaka or Malacca… (Malay: Melaka), dubbed "The Historic State, is a Malaysian state on the Malay Peninsula's southwest coast. The capital, Malacca City, has a colonial past seen in its preserved town centre, the site of 16th-century, Portuguese St. Paul’s Church. It's also home to Christ Church, built by the Dutch in the 18th century and converted to the Anglican denomination under British rule in the 19th century. 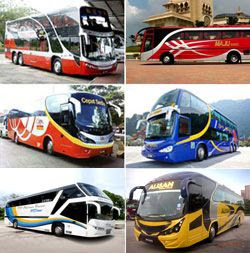 One can fly to KL and take a bus or taxi to Melaka, but we have always chosen to take the coach direct from Singapore. Travel time (via Coach) is 3.5 hours and is a clean and comfortable journey. For this last trip I booked through EASYBOOK. We do not always choose the cheapest as they have extra stops and are more crowded. On the EASYBOOK site, look carefully at the prices as well as the pick up and drop off points. Then look at departure times and arrivals. Take all this into consideration for maximum comfort and practicability for your travel experience. There is always one “toilet stop” en route to Melaka. Take hand wipes, tissues etc with you! 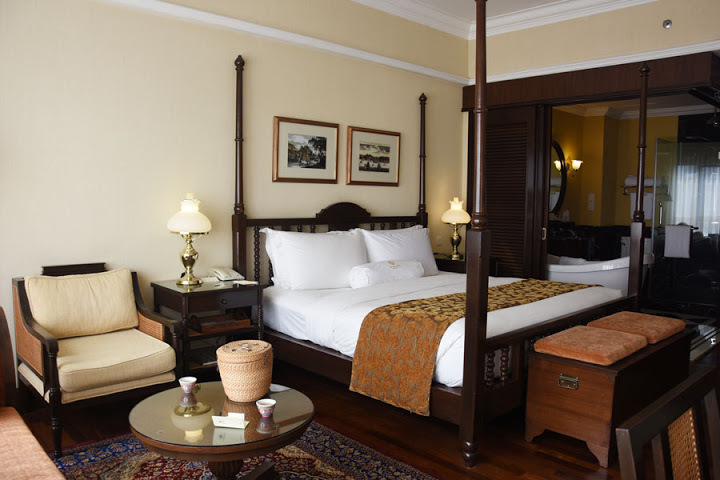 Leaving early morning will get you to Melaka by lunchtime, which means plenty of time to have lunch then check into your hotel. Coach fare is between $28.00 and $42.00 per person each way. The coach company usually supplies a bottle of water prior to boarding, but you might like a snack to take with you as well. Sometimes the coach can be cold so take a jacket, scarf, pashmina or something to keep you warm during the journey. Book well ahead to get the coach company you prefer. This particular trip we had to choose a different tour company for the return journey. Our departure was at Golden Mile Tower and arrival was at Melaka Sentral. The central terminus is rather a large complex and easy to become ‘lost’. Take note of where you are at all times. When departing Melaka (from Melaka Sentral), arrive earlier so you know exactly what bay your coach departs from. This is a very large and busy terminal! There are many hotels and resorts in and around Melaka to choose from. All with various price ranges as well. 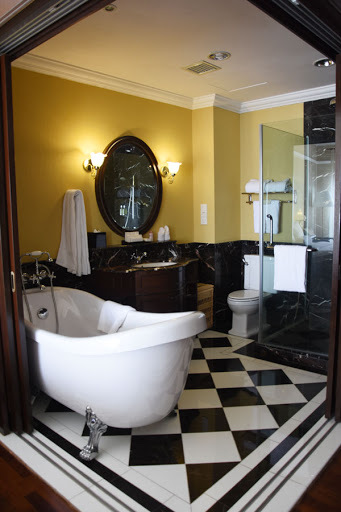 On one of our trips we stayed at The Equatorial, which is hugely popular with families and is conveniently located too. 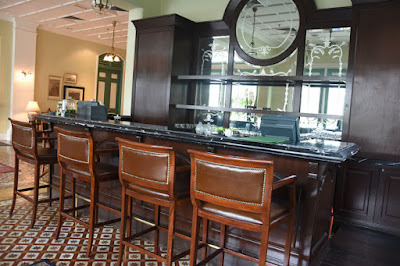 This time around we stayed at The Majestic Malacca. Probably a little over ten minutes drive time from the bus terminal. 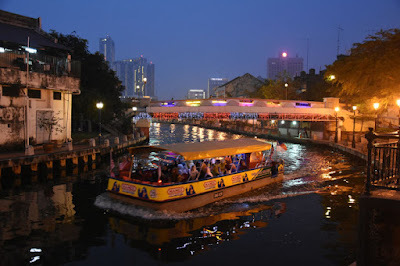 Right on the banks of the Melaka River and easy walking distance to Jonker Street in the cooler pert of the evening. But over and above that, the service is impeccable. From the moment of arrival to the time of departure, we were well looked after! Our room was on the seventh level overlooking the river and was quite large and very comfortable. We had a king sized bed, a day bed, small table & chair, TV, tea & coffee making facilities, toweling robes, slippers etc. The bathroom and the associated bathroom amenities were of a high quality. The breakfast – served in the dining room on the first level – was buffet style that included everything anyone could possibly need. But there is a menu available listing the hot breakfasts. The service was impeccable in both the dining area and the hotel overall. We could not fault anything. Even when we asked where we could have ‘afternoon tea’ with our guests, we were told to sit in the ‘library’ and it would be brought to us. This was a full on High Tea served to the four of us and again, the service was excellent. We stayed for three nights four days and whilst there we had two trips on the ‘river cruise’, once at night and once during the day. 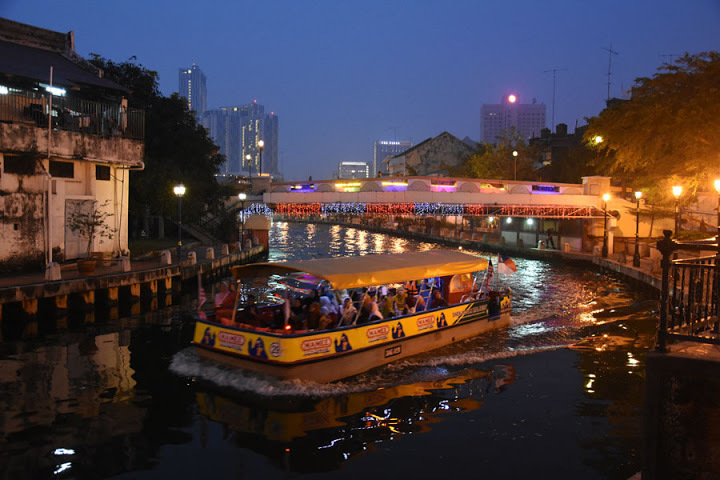 Other events were a walk to Jonker Street, a walk along the riverside stopping every now and then for a coffee or a beer, shopping and walking through the amazing Heritage Village – Kampung Morten! Kampung Morten is nestled right within central Melaka. 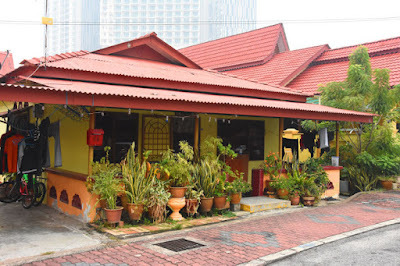 The highlight of exploring the area, with its merry bridge and homes shaded by palm trees, is a visit to this living museum within a 1920s kampung house. Visitors (or rather, guests) are welcomed by a member of the household who points out period objects including photographs, Ming dynasty ceramics and a century-old Quran. You're unlikely to leave without a photo-op on plush velvet furniture or a few strikes of the lucky gong. This is a guest post byLeone Fabre, who repatriated back to Melbourne over three years ago. She always looks forward to flying back to Singapore from time to time. This is a really good read for me. Must agree that you are one of the coolest blogger I ever saw. Thanks for posting this useful information. This was just what I was on looking for. I'll come back to this blog for sure!